Good Life Project™ is a movement. A set of shared values. A community. 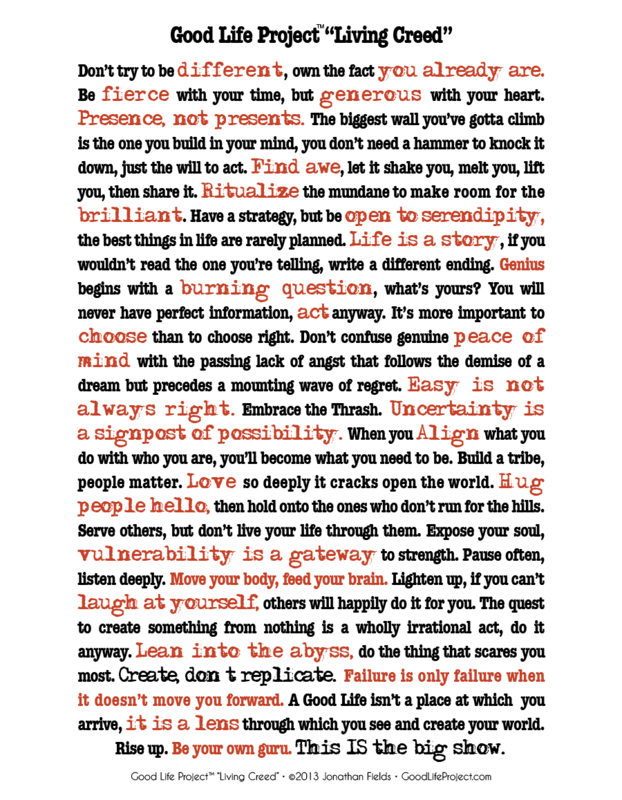 A creed, bundled with a voracious commitment to move beyond words and act. First, as a manifestation of your soul. And then as a quest to have the adventure of a lifetime, and to leave the world around you changed. It’s about building an extraordinary life, deeper relationships and meaningful bodies of work, businesses and movements. It’s about becoming a creator, a leader, a mentor, a giver, a doer. It’s about telling a story with your life that you’d want to read and share. Um, I’d like some of that please. For me, Good Life Project is about watching/listening to people who have awesome businesses talk about how it all came together and their definition of what makes a good life. It is a whole lot of inspiration and food for thought. And there is a CREED. Check it out. If you haven’t already, go check out Good Life Project and then tell me what you think. What websites do you love? This entry was posted in Best of the Blogs I Read and tagged Brene Brown, Gala Darling, Good Life Project, inspiration, interviews, Jonathan Fields, Lisa Congdon, Lissa Rankin, Seth Godin by Teacher Goes Back to School. Bookmark the permalink. I am having such a good time watching these videos! Thank you for posting. Much appreciated! I love them each so much I’ve been listening on repeat on long drives. So much good stuff in there! I’ve been listening on repeat. So many good ideas!